Getting ready for the York Show in just a few weeks! I'm still working hard on the Multi-Bingo. As of this recording, I have 24 games complete. This year should be a lot of fun! York is always fantastic - I did many episodes last year detailing some of the great games I've seen there in previous years, but just know that York is more than bingos, it's more than solid state, it's more than EM - it's a great blend of all pinball and other games and decor. This year, the York show is on Sept. 30th and Oct. 1st. Come out and meet me, play the multi, and learn how to play a bingo! 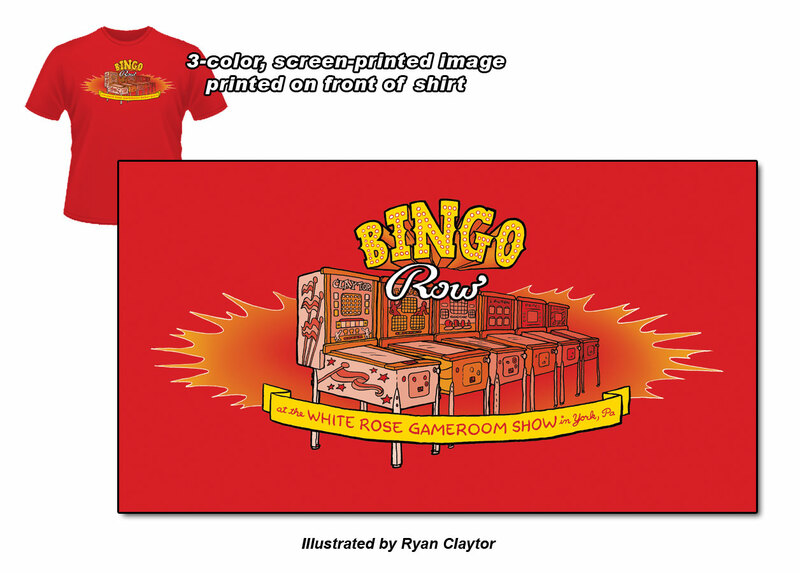 If you are able to make a four or five in a line (subject to availability), I will give you a free Bingo Row t-shirt illustrated by Ryan Claytor! I'm really excited about this design, and seeing folks wearing this shirt around the show. Last years' giveaway was very successful. I'm looking forward to seeing friends old and new at York, and playing some new games. If you'd like to purchase a t-shirt (if you're not able to make it to York), check out the podcast website, http://foramusementonly.libsyn.com to buy your own today. Bingo Row T-Shirts for the 2016 York Show! What's that T-Shirt? Illustrated by amazing pinball artist, Ryan Claytor, these incredibly soft, ring-spun t-shirts are the same quality as my podcast t-shirts. These shirts will be available in extremely limited quantities at the White Rose gameroom show in York, PA Sept 30th and Oct 1st as giveaways for anyone who can make a four or five in line on any of the glorious bingos in bingo row! Or, if you cannot attend, or just want to ensure you get one of your very own, you can buy below. Steve Young is the owner of the Pinball Resource, and he is a wealth of knowledge. We discuss his start in the hobby, some of his best-loved games, thoughts on specific games, the business of pinball, and much more! Visit http://www.pbresource.com to see some of the parts that are available. Steve is constantly working to bring us new parts, and you can see some of his work at http://pbresource.com/news.html. Contact Steve for parts orders at 845-473-7114. Pinball Resource is a fantastic, well... resource!